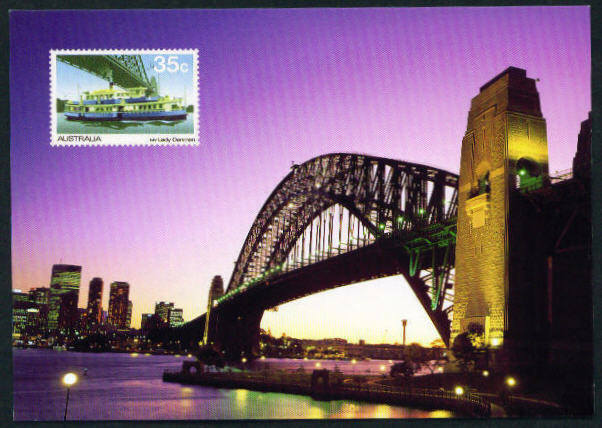 Opened in 1932 as a combined road / rail bridge, Sydney Harbour Bridge is one of the premier icons of Australia. 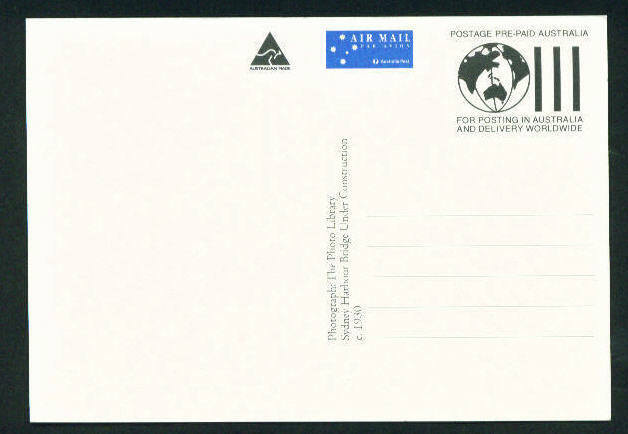 It appears on numerous postage stamps, miniature sheets ( including sheet borders ), several items of postal stationery, a Parcel label and even a Commemorative Telegram. Unlike many of the railway articles, this is an ongoing project, as new issues will, no doubt, continue to appear. I hope it is reasonably complete, but please let me know of anything omitted or when anything new appears. 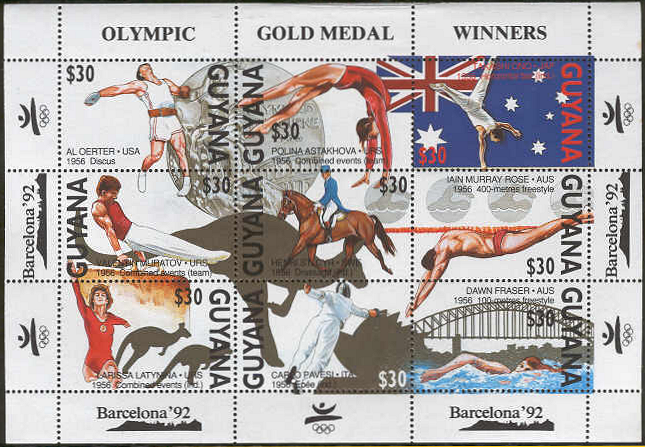 Gutter Pairs: Many of the Australian stamps exist in gutter ( interpanneau ) pairs. I have included information on these only for the inaugural 1932 issue and later issues where the gutter is pictorial. 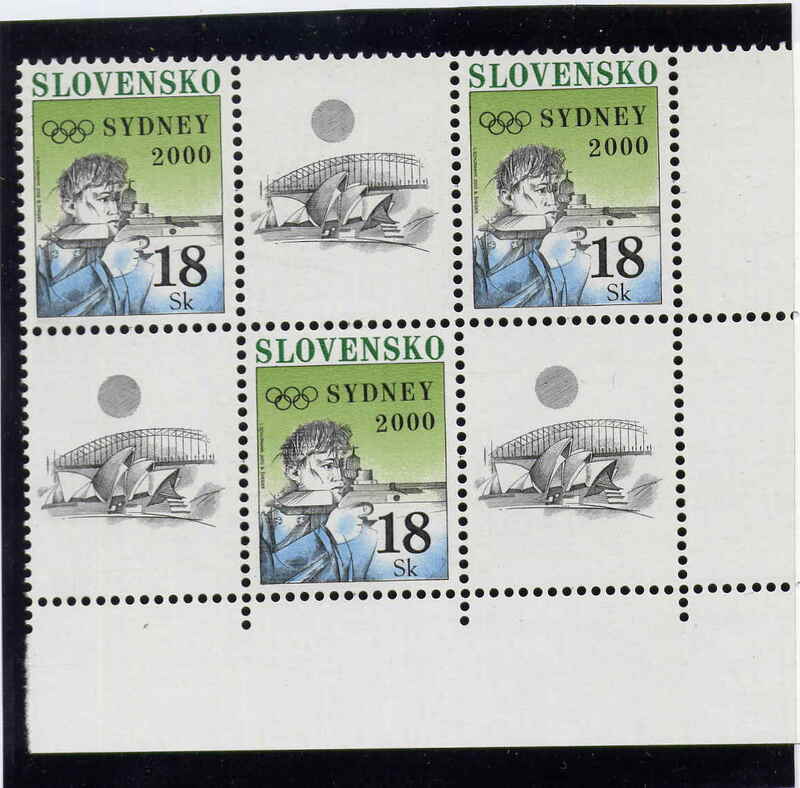 I have only included one or two catalogue numbers ( SG ), where such detail might help to identify a stamp. 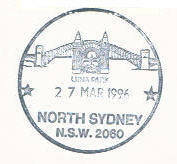 Section 5 : Postmarks relating to the Bridge. 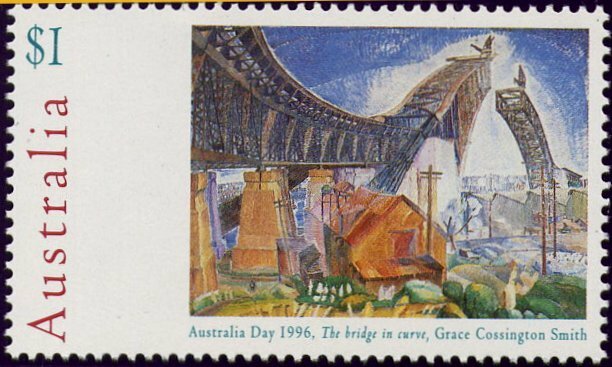 A feature of the stamps of the Bridge is that only one of them actually shows a train - or even the tracks, and the one that does, 2004 50c, shows only a distant view of a train. 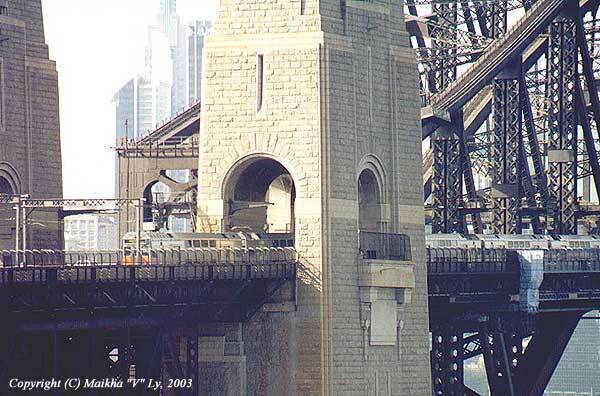 So, to illustrate the railway properly, please find below a very pleasing portrait of a train leaving the Bridge, reproduced by kind permission of Maikha Ly of Australia. Please note that his photograph is copyright. Above: 2d Recess ( optd. O S ); below: Typographed 2d ( with gutter ). 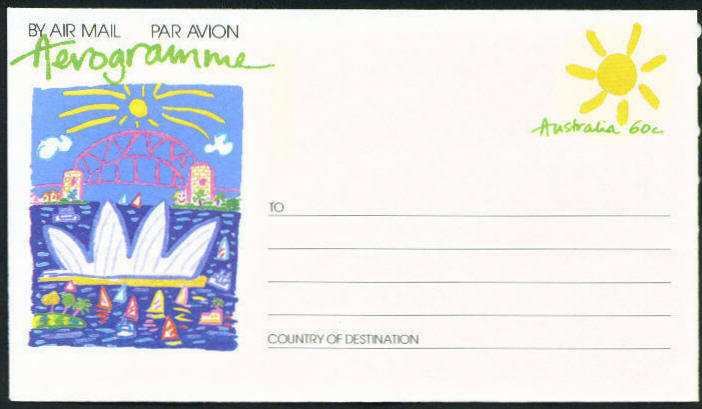 Note: The wavy-line appearance of the typographed 2d is not present on the stamps, but was created by my scanner. 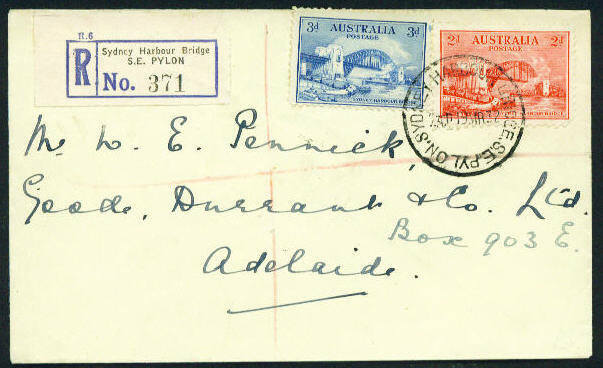 Note : This Forgery was produced to defraud the Post Office, not the collector. John Ash Imprint : All the 1932 values above ( except for the forgery, I presume ! ) exist with the Printer's Name ( John Ash etc. ) in the centre of the bottom margin of the sheet. In the case of the typographed 2d, this imprint is across the gutter. 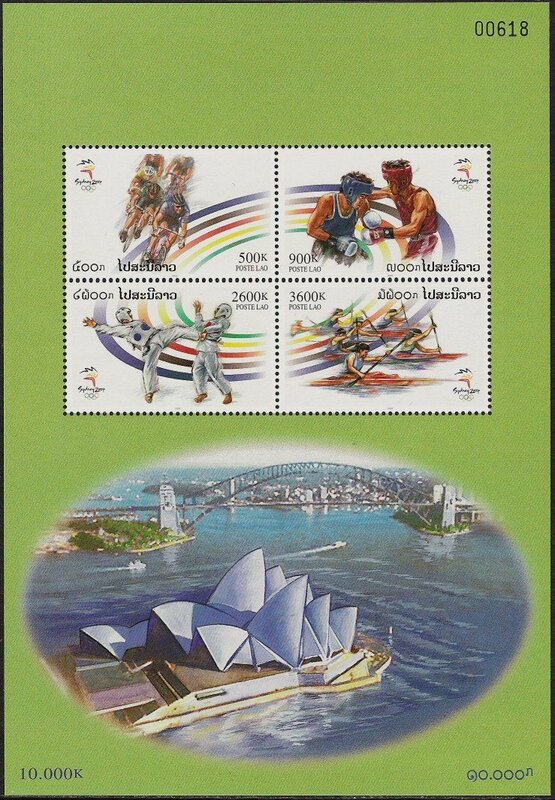 Many Australia collectors are quite keen on these imprints. 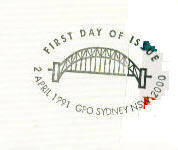 This stamp is part of a joint issue with Great Britain ( q.v. ). 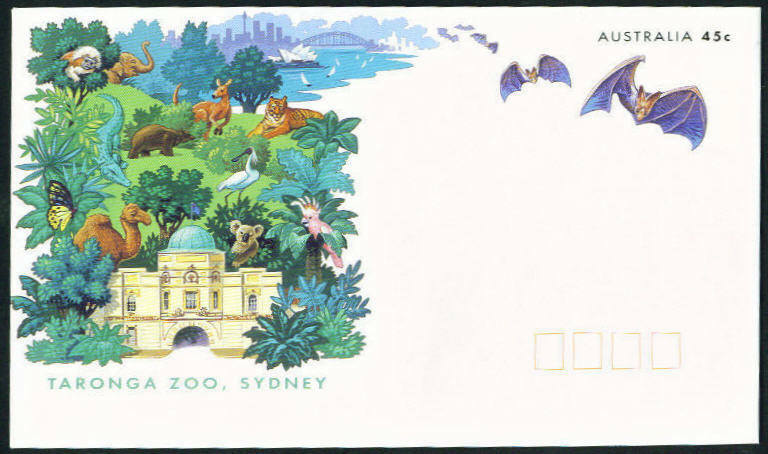 The Australian version was printed with the rows offset, so that both horizontal and vertical se-tenant pairs were produced. On the G.B. 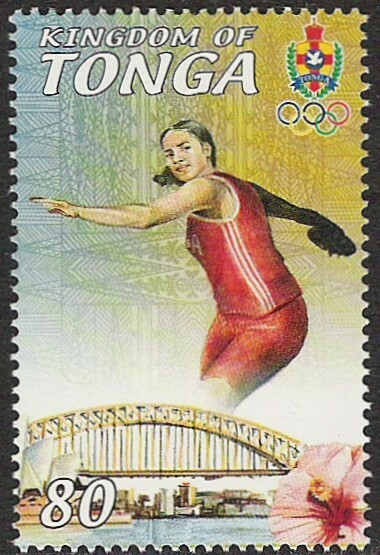 stamps, only horizontal se-tenant pairs exist. 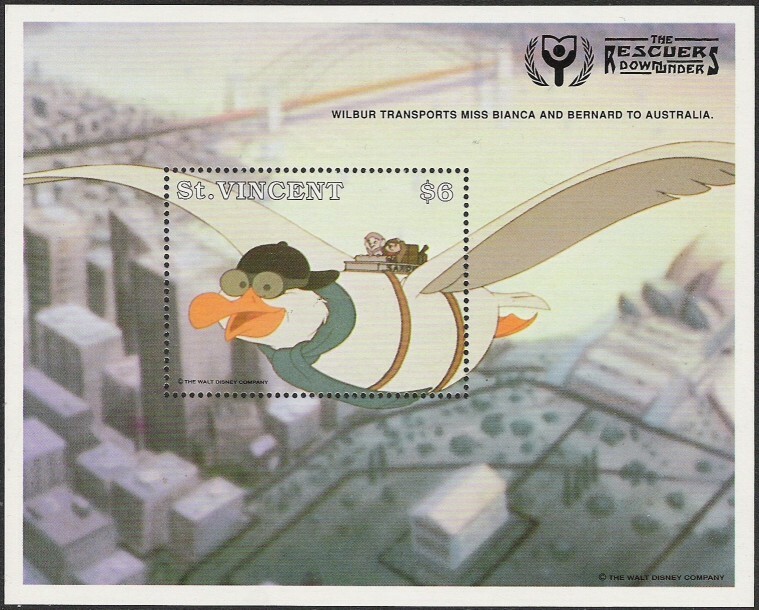 Note: This stamp was ONLY issued in booklet form and is rouletted x imperf. 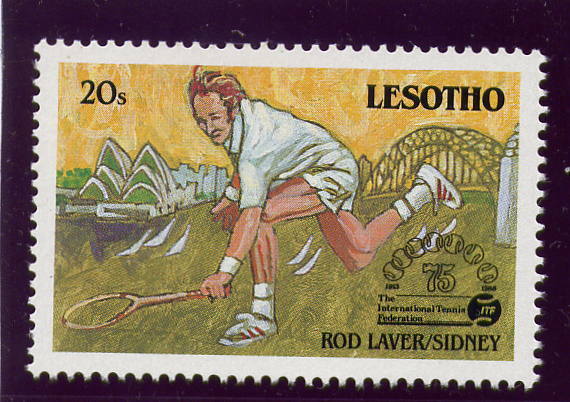 The sheet stamps ( Perf 14½ ) were arranged within the sheet to produce both horizontal and vertical se-tenant pairs. 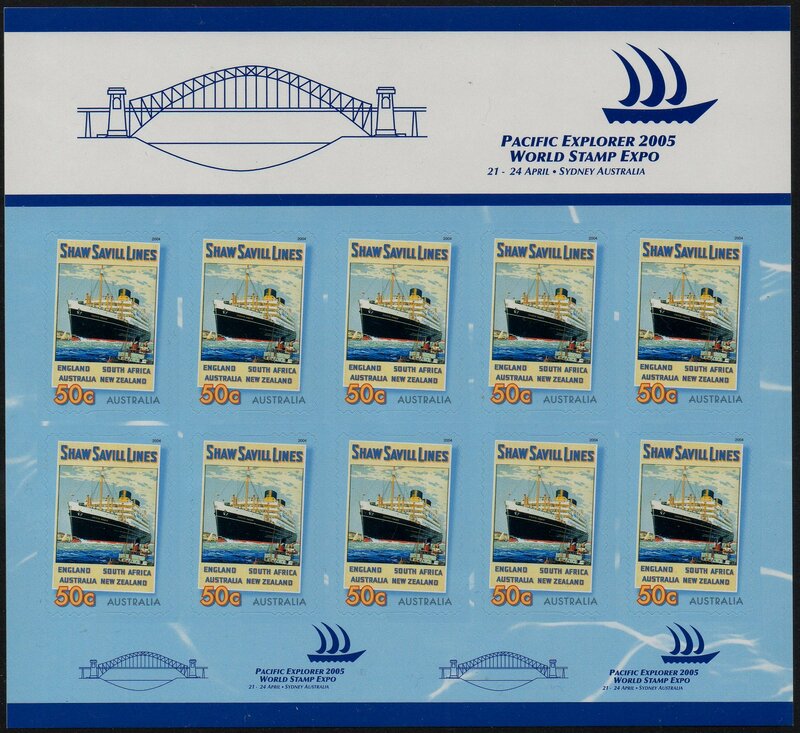 The self-adhesive stamps came se-tenant in rolls of 100 stamps. This sheet is a non-album-friendly A4 size, approx 11.75" x 8.25" ( 29.85 cms x 20.95 cms). 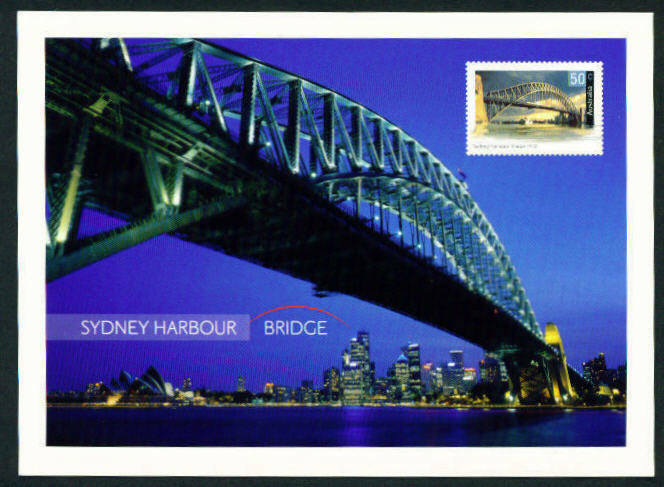 [ . . ] 2004 Set/5 bridges (all 50c ), one the Sydney Harbour Bridge, se-tenant strip/5, normal gum. 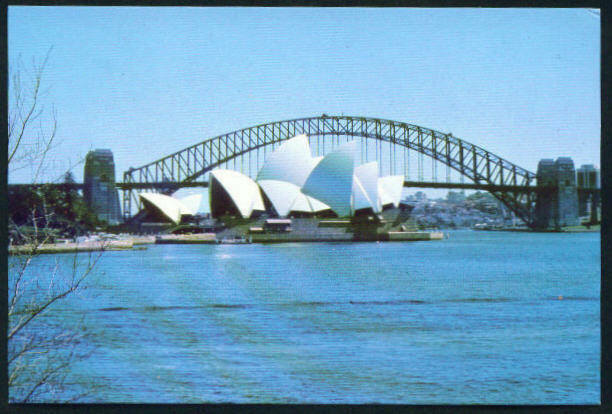 [ . . ] Sheetlet/4 ( all are Sydney Harbour Bridge ). Normal Gum. Bridge also in background design. 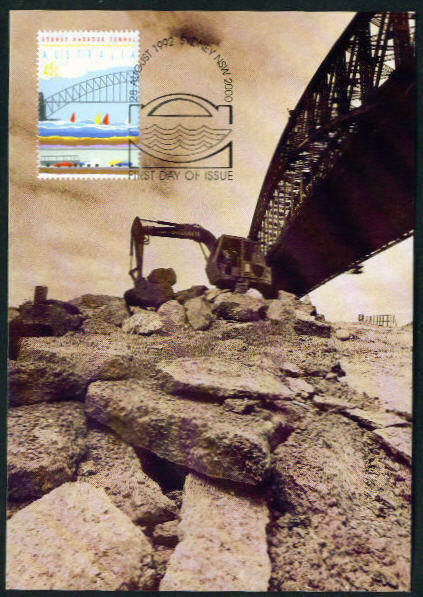 [ . . ] - ditto - booklet pane with 2 each of the five bridge stamps, self-adhesive, not se-tenant. 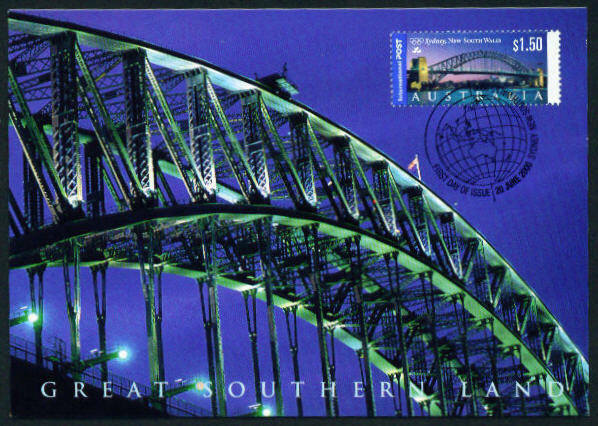 The sheetlet/4 comes from the Landmark Bridges ' Prestige Collection ' booklet, which includes several photographs and some text on the Sydney Harbour Bridge, as well as a night view of the Bridge on the booklet cover. 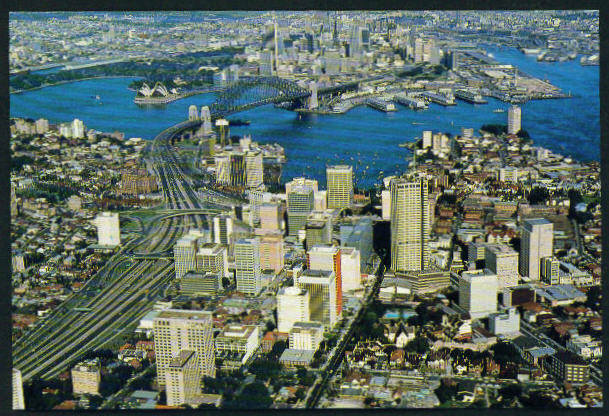 Sold by Australia Post only in bulk quantities, I believe, principally to businesses and only for use on parcels within the Sydney area. 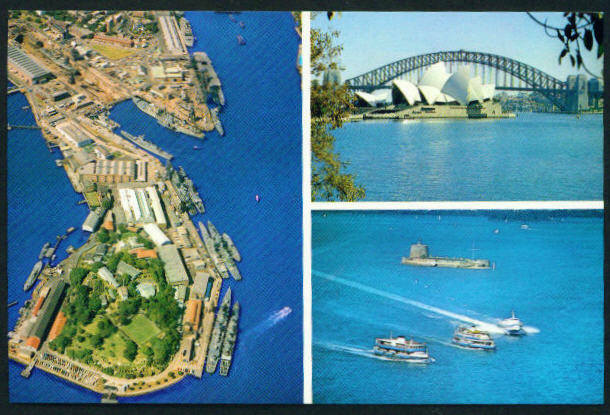 A similar issue was made for Perth, but with the Bridge replaced by a Swan. 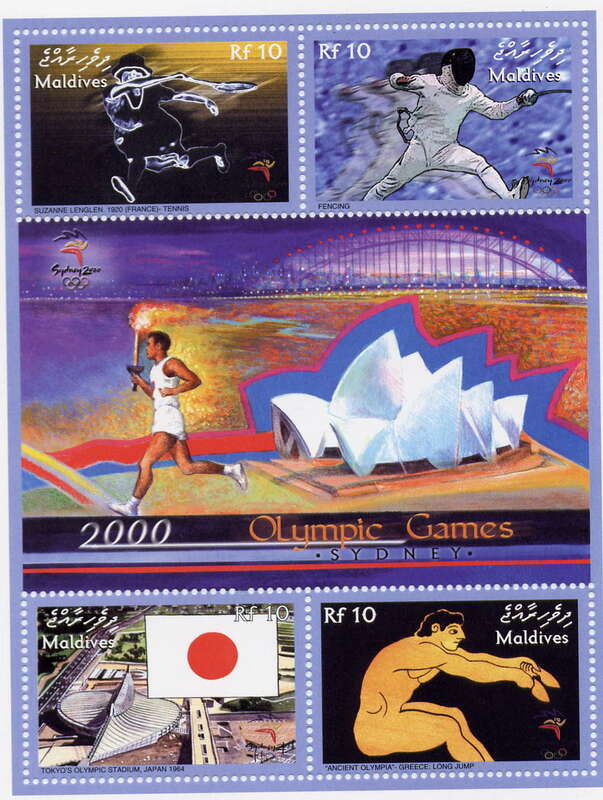 These labels are not in the main stamp catalogues, presumably because, technically, they are Local Post stamps. 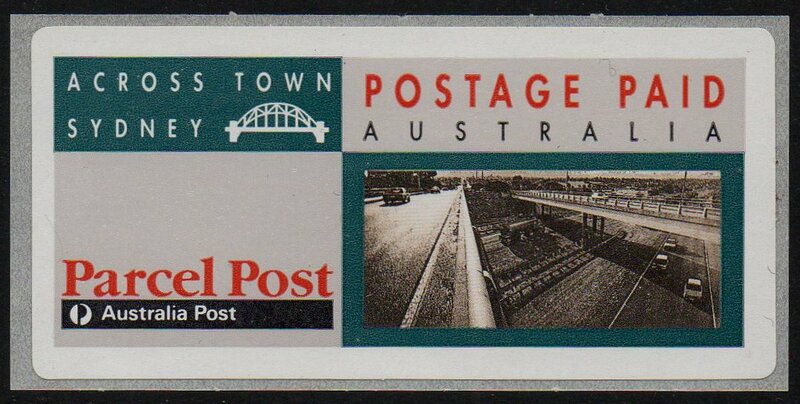 The road bridge image is from a 1989 ( Sept 1st ) 41c Urban Environment booklet stamp ( SG 1216 ). [ . . ] Barbuda ? 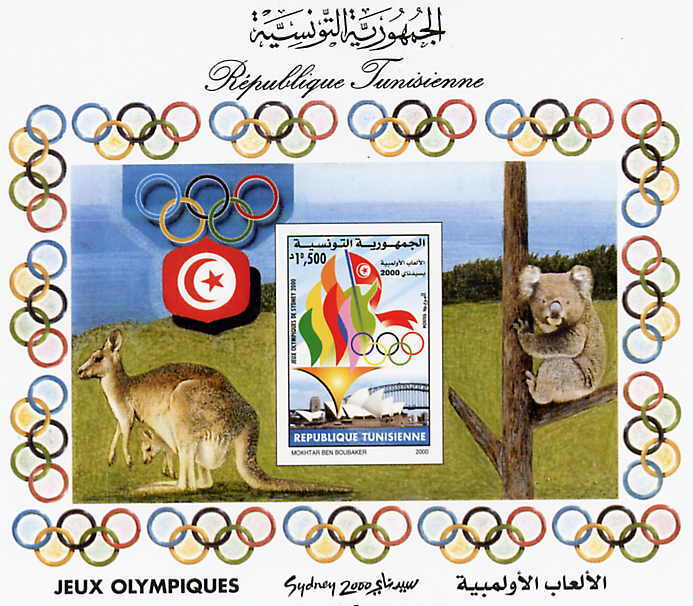 This stamp is part of a joint issue with Australia( q.v. ). 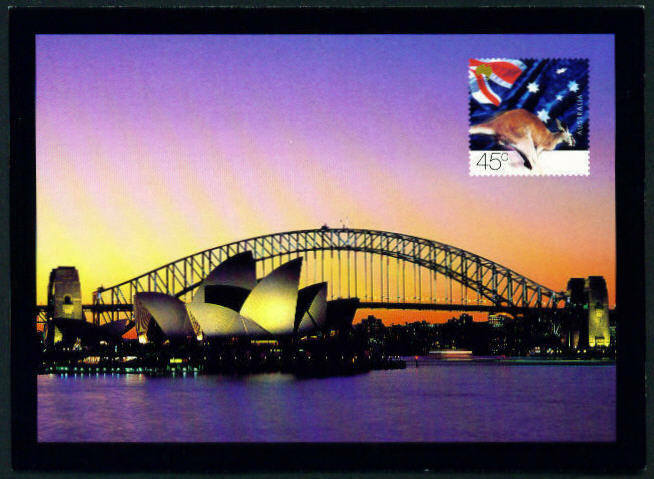 Unlike the Australian version, which was printed with the rows offset, providing both horizontal and vertical se-tenant pairs , the G. B. stamps only exist in horizontal se-tenant pairs. Note: Bridge is on Label only. 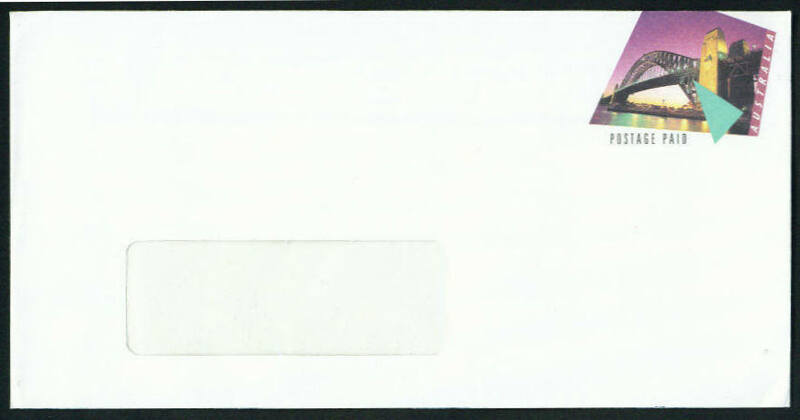 Alternate rows start with either the stamp of the label, providing the stamp se-tenant with the label both vertically and horizontally. Note 2. 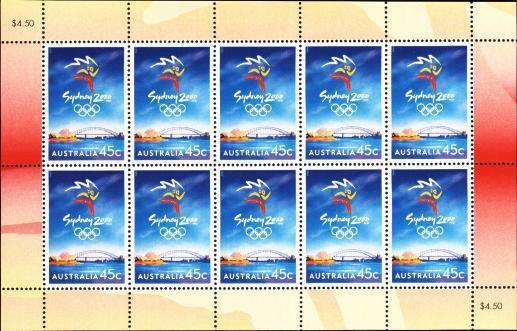 The stamps from normal sheets have a different watermark to the miniature sheet. 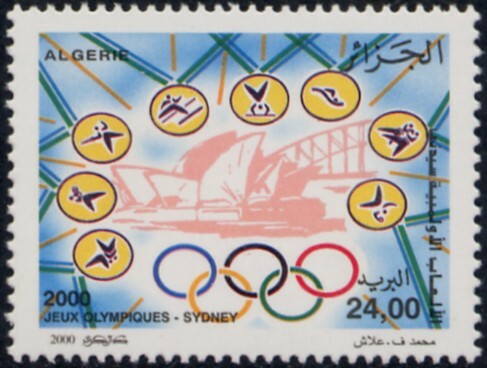 [ . . ] Yugoslavia 2000 Olympic Games, with Bridge on interpanneau ( gutter ) label. 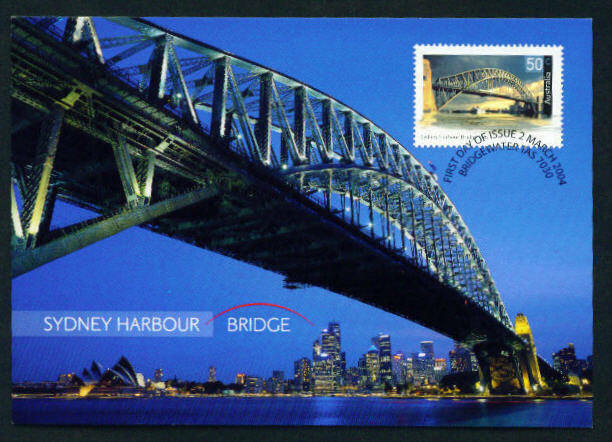 The Bridge appears only in one of the four sheetlets in the set. 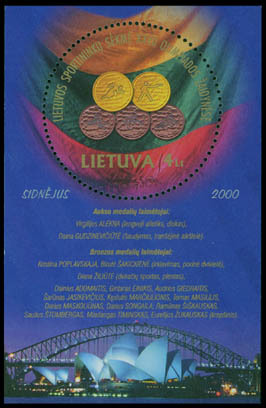 It is the central label of a sheetlet/9 ( 8 stamps and the label ). I should like to thank Keith Downing and Hans Eriksson for providing almost all of this part of the listing. 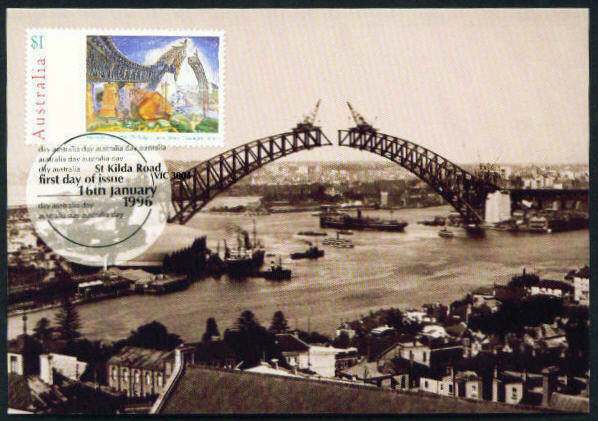 Note 1: Where an item is marked ' Postcard* ', it indicates that both the ' stamp ' and the view side of the card include the bridge. 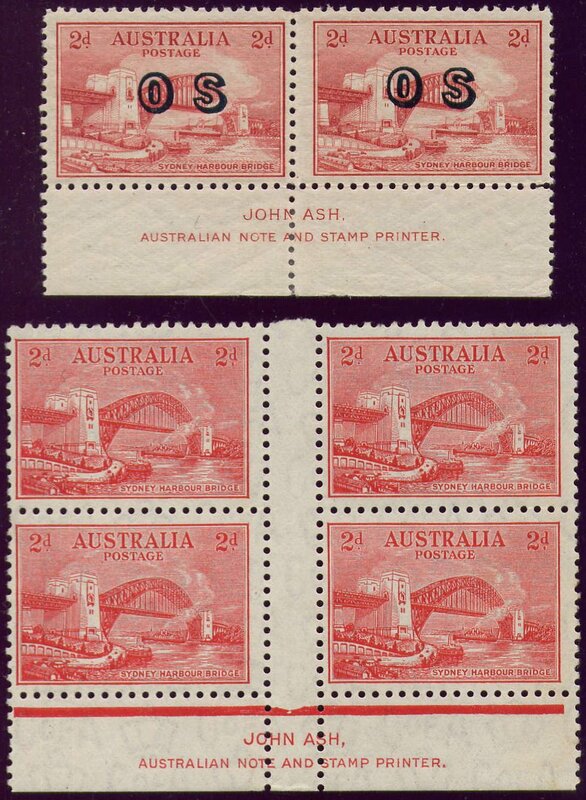 Note 2: The Maximum Cards ( Maxicards ) listed have a ' Paid ' frank on the obverse side and a postage stamp on the reverse side, as issued by Australia Post. An illustration of a typical obverse ( frank ) side appears above. 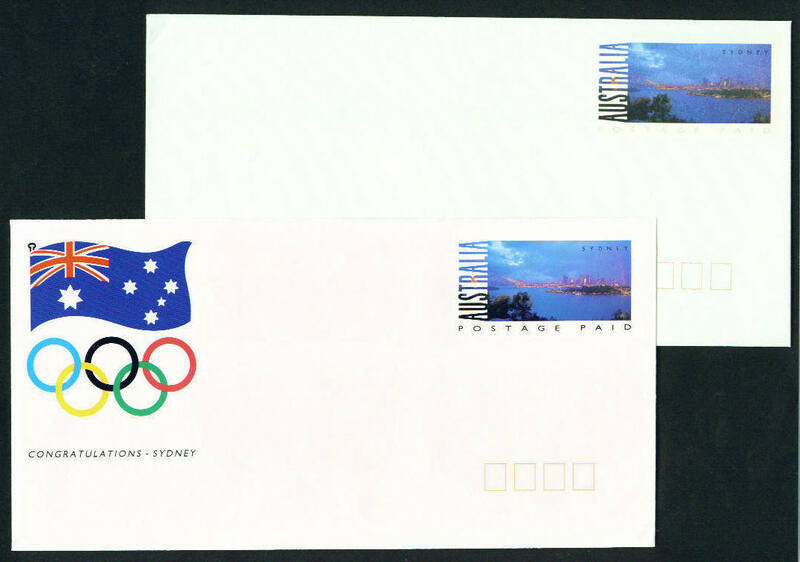 The reasons surrounding this double franking are not clear to me, but may perhaps involve postal regulations requiring adequate postage to be on the address side ? 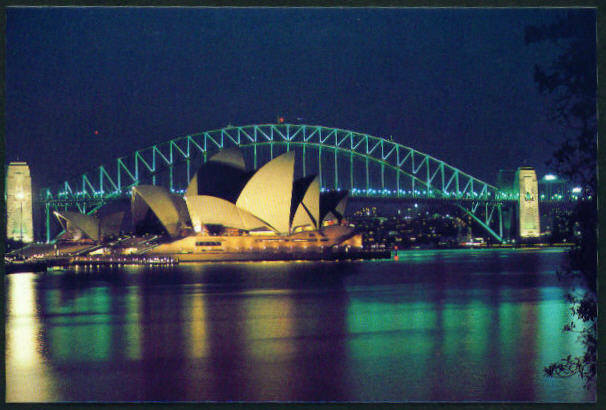 I do not know if these cards may be purchased mint, without adhesives ( i.e. 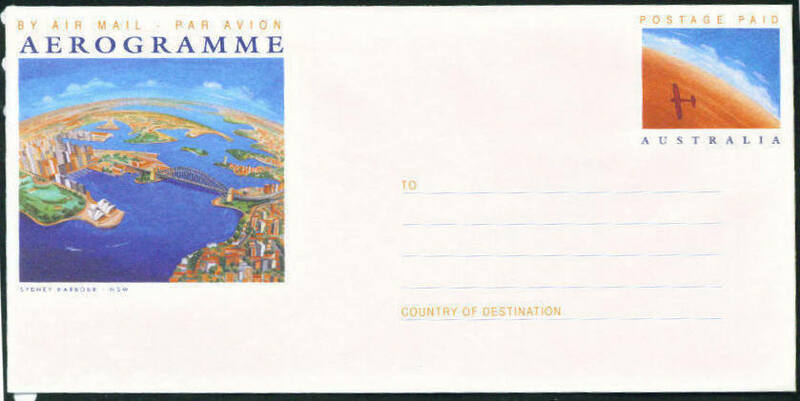 stamps ) on the reverse side and, therefore, whether or not they may strictly be considered to be postal stationery. 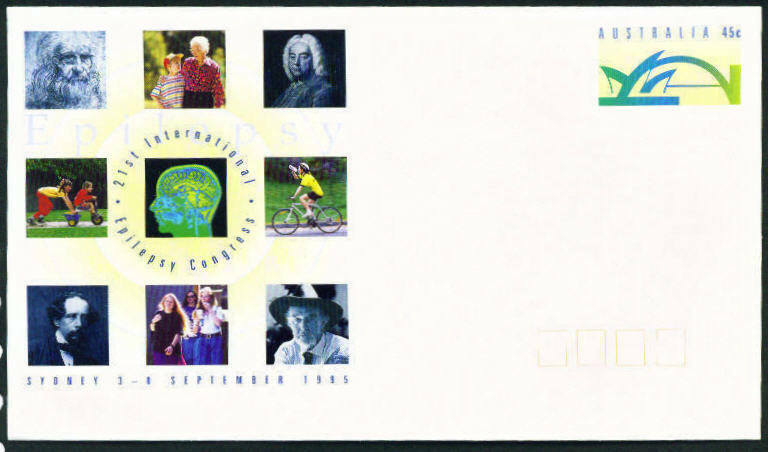 [ . . ] 39c 20 Nov 1988 Club200 envelope for bi-centennial / Diabetes. 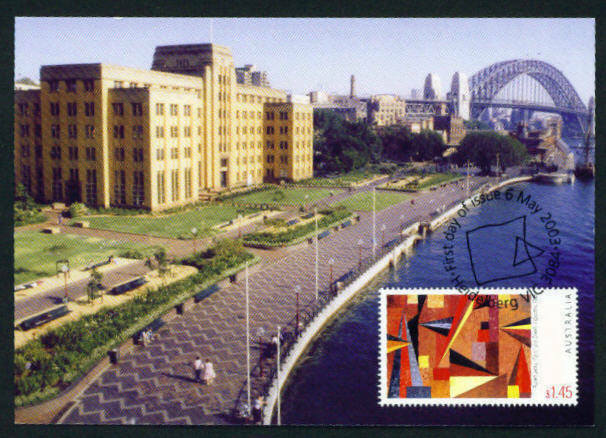 [ . . ] 55c 8-Jun-95 large window envelope - stamp shows bridge. 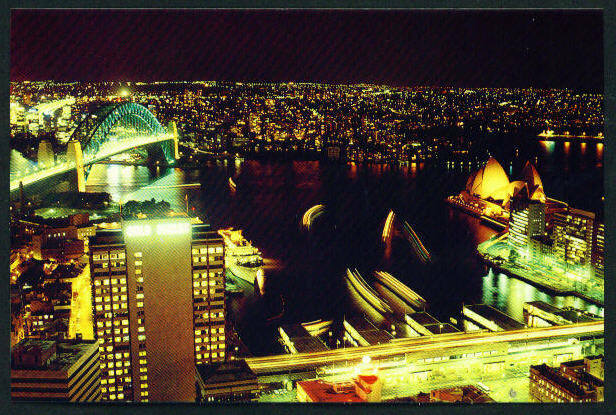 [ . . ] 'Paid' 2 - Mar - 04 maxicard - View of Bridge. Paid Frank on back. 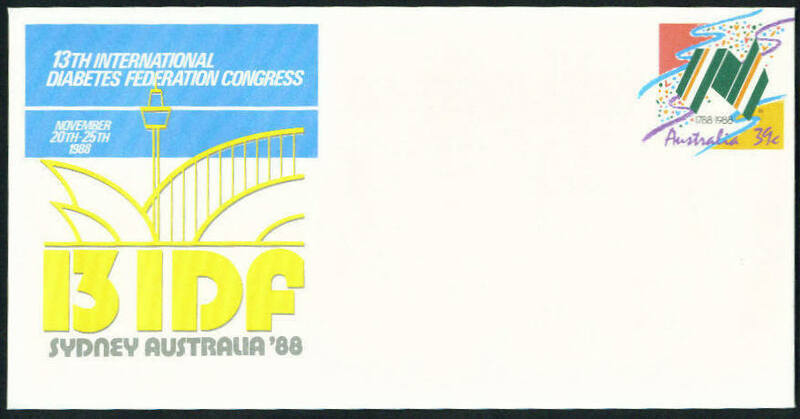 Scan shows attached adhesive on front. 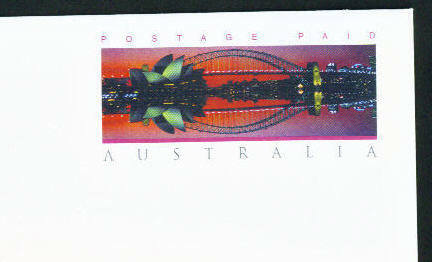 [ . . ] 'Paid' 6 - Sept - 2004 Postcard - View of Bridge with 50c bridges IMPRINTED stamp illustration. 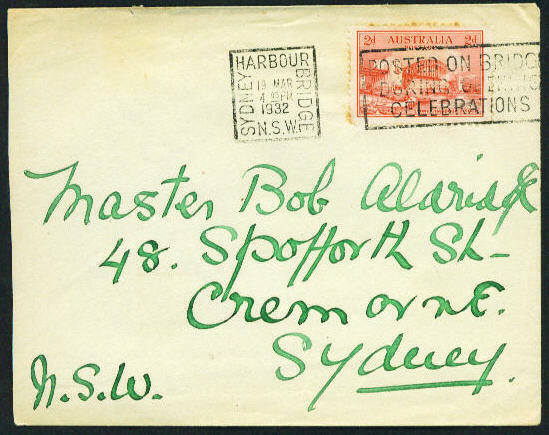 For a scan of this special telegram form (and its accompanying envelope), produced in 1932 to permit the public to send friends a souvenir message from the Bridge, please click the link below. If you do not have Broadband, you may find that this is quite a large file to download! For those taking part in one of those quiz nights ( ! 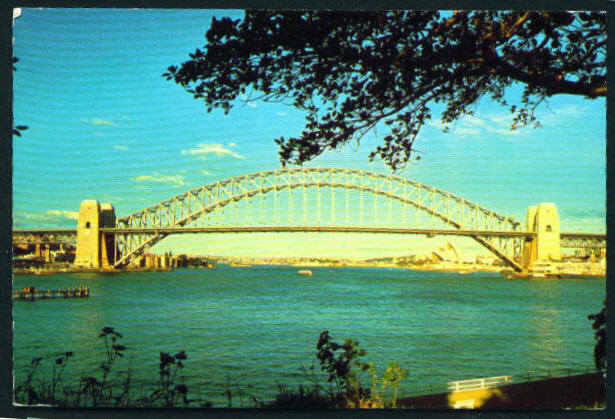 ), Sydney Harbour Bridge spans Jackson Port and was built by Freeman. 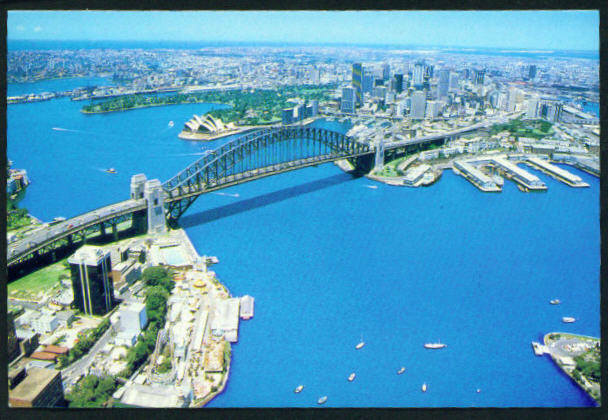 The span of the arch is 1654 feet ( 504 m ) and the height of the road / rail deck above sea-level is 171 feet ( 52 m ). 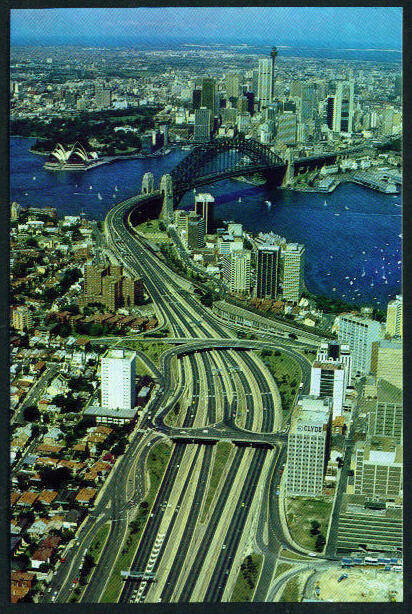 The deck is 98 feet ( 30 m ) wide with 4 railway tracks, a 6-lane highway and 2 footpaths. The towers, also known as pylons, are 505 feet ( 154 m ) high. 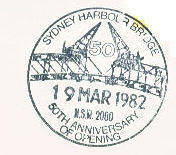 For more information, click here for a Non-philatelic website about the Bridge ( opens in new tab ). . . . . . . HOME PAGE . . . . . . Provides links to all sections of website . Note: You may already have an open tab for this.